Are you looking for a used RV for sale by scanning the newspaper classifieds or calling phone numbers written on a recreational vehicle parked on the corner? There is a better way to find a pre-owned RV that is well-built, reliable, and comes with assurance that it is in good condition. If you want to find a great deal on a new or used RV you need to make an online visit to a dealer like PedataRVCenter.com. They not only offer a line of brand new top of the line Holiday Rambler RVs, but for those who are interested in a used RV for sale, they offer makes and models from the other leading manufacturers as well. You may be thinking that going to a dealer will cost you more money than buying a used RV for sale from a private seller. While this may initially be true, over the course of time it could end up costing you a great deal more-including your trust. You will have to find your own financing through a bank or credit union. You will have to register the vehicle yourself and get the taxes paid. You will not be offered a warranty or extended warranty for the used RV for sale or continued customer service after the sale. All of these things not only add to the convenience factor of buying from a dealer, but they also give you and added measure of confidence in this very important investment. 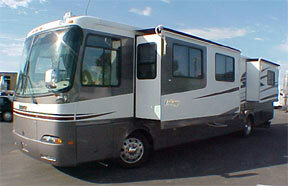 Beginning with the search, buying a used RV for sale from a dealer like Pedata has its definite advantages. Where else can you find listings for not just one or two RVs in the class that you are interested in, but several? 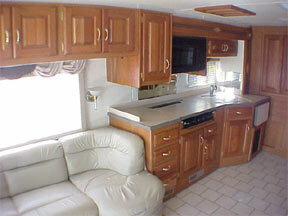 You can pick from RVs with several different floor plans and options. You can choose the one with the lowest mileage or the one in your favorite color. The website has information on all of the different types of towables and motorized recreational RVs so that you can choose the used RV for sale that best fits your lifestyle and budget. Financing is also much easier when you go to a dealer. If you visit a bank or credit union for financing, chances are that they will not have products that are designed specifically for buying any type of RV. But if you visit a dealer they will have a loan that is for buying a used RV for sale. A dealer will be able to offer you several different products and flexible financing terms with the interest rates and length of financing. You can even get an idea of what your monthly payments will be on your used RV for sale before you contact a dealer by using the online RV financing calculator that is offered on the Pedata website. Simply enter the price of the RV that you are looking at, the current interest rate, and the length of financing and within minutes you will know if you can afford that used RV for sale. While you are checking out the pre-owned RVs you might want to take a peek at the new Holiday Ramblers. As a wholesale dealer we can offer deals that no one else can beat. You might be able to get into a brand new RV for the same price that you would pay for a used RV at some of the other dealers. You can have it custom designed exactly to your taste. Whether you end up with a new or used RV, you will love the freedom and luxury that you enjoy in your recreational vehicle. With a family, or just with friends or a partner, the RV lifestyle is second to none.